Anne Casale began teaching cooking in 1963, when she founded Annie’s Kitchen, and later served two terms as president of the New York Association of Cooking Teachers. She has taught in cooking schools throughout the United States, and in 1988 the James Beard Foundation named her one of the year’s best cooking teachers. She has appeared on numerous television and radio programs, and has worked as a lecturer, consultant, and designer for restaurants, gourmet shops, and cooking schools. 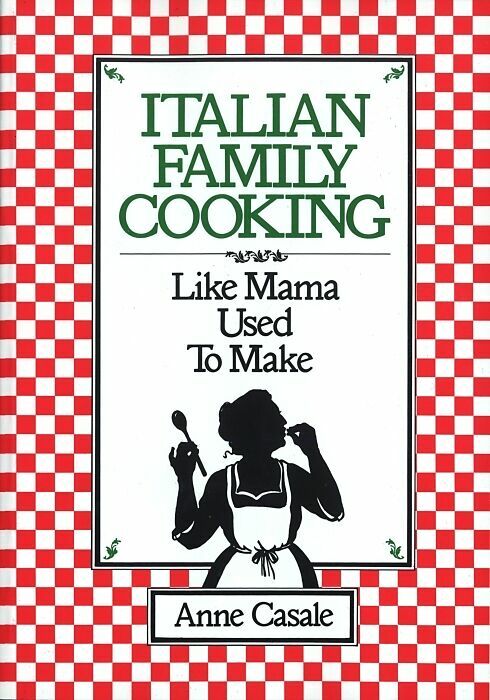 Casale is the author of Italian Family Cooking, Lean Italian Cooking, and Lean Italian Meatless Meals. Anne Casale invites you into her kitchen to share the special secrets behind hundreds of home-style recipes that have been part of her family's heritage for years and years. -- Sicilian Cassata with Chocolate Frosting ...and many more! For beginners and experts alike, here's a cookbook full of old-fashioned warmth, wisdom, and goodness -- updated for you and your kitchen. Prized family recipes are creations that not only satisfy the palate, but warm the heart with the memories they generate. Every family-inspired recipe created for this book has been developed to capture the original magic I recall. 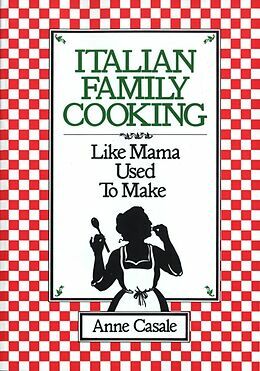 Italian Family Cooking has been designed to share my culinary heritage with today’s cook in today’s kitchen. The recipes in this collection are presented in a clear, precise manner. The procedures are written in simple steps as they are needed. Incorporated in the procedures are specific cooking techniques that will instruct the beginning cook or reinforce, refine and expand the skills of the more experienced one. Ingredients are listed in the order in which they are used. Each measurement is standard and allows the reader to reproduce the selections without guesswork and with confidence. I recommend that you read the chapter on ingredients before starting any of the recipes. An understanding of the ingredients being used can only add to a cook’s security and confidence. Planning is the key to carefree cooking. It is extremely important to have all your ingredients and utensils readily at hand before you start to cook. Consult your recipes in advance and jot down all the ingredients you’ll need, even the most obvious. Without your list you may find yourself up a creek minus the salt and pepper, or waiting for an oven to preheat. Note when the same ingredients—such as chopped onion or minced parsley—must be readied for several recipes: do all the preparation, then divide the ingredients and place required amounts in separate bowls. Clean up as you go along. Read through each recipe again before starting. If you are properly prepared, cooking can be easy and fun. One of the most versatile kitchen appliances available to today’s cook is the food processor. This time-saving device opens up a world of culinary possibilities, for it is capable of performing a large percentage of the tedious work in the kitchen. Many recipes found in this book incorporate the food processor. However, specific directions are always included for those who may not yet have a processor. My strong suggestion to you is—buy one; you won’t be sorry. If you find yourself torn between enthusiasm for entertaining and dread of spending long hours in the kitchen, stop. Remember that an elegant menu needn’t mean a lot of last-minute fussing. Once again, planning is essential. Read through the recipes carefully to select ones that don’t require last-minute preparation. Many desserts can be made a day or two in advance. You can also find any number of pasta sauces that can be done ahead of time and reheated. While suggestions for menus and pointers for successful menu planning appear in a later chapter, hints for variations on recipes as well as additional menu suggestions are listed before many recipes. If you are a novice at cooking, I would not advise your starting off with Rotolo di Pasta. Buy some good imported or fresh pasta and begin with one of the simple sauces. You can have dinner in no time flat. Remember, confidence is gained through experience. I hope this cookbook will send you directly into the kitchen, charged with excitement over new methods, ingredients and taste combinations. When it comes to selecting the ingredients for the recipes you have chosen, I implore you to follow the words of Papa Casale: “What one puts into a dish, one will find.” Since you want your guests to be served food that’s nothing short of wonderful, insist on starting with nothing less. Many of my students have little cooking experience. While they learn recipes, techniques and procedures in class, they also come to appreciate the range of top-quality ingredients that are essential for all dishes. This is obtained by drying and grinding the rootstalks of a tropical plant of the same name. It is used as a thickening agent which leaves no floury aftertaste. Arrowroot gives a clearer sauce than other thickening agents such as cornstarch or flour. Always dissolve arrowroot in a little broth, wine or water before adding to any sauce or gravy. Remove pan from heat before adding dissolved mixture. Dry—Arrange slices of bread in a single layer on cookie sheet. Preheat oven to 250° and toast bread until crisp and golden, about 30 minutes. Break into 1-inch chunks and whirl in food processor fitted with metal blade until finely ground. Place crumbs in fine mesh strainer and sift into large bowl. Discard any large crumbs or whirl again in food processor. Pack into jars and keep in cool dry place until needed. Should be stored in refrigerator during summer months. Fresh—Cut up fresh or day-old bread, including crust, or tear it gently with fingers. Place in food processor fitted with metal blade. Run machine until bread is reduced to coarse crumb consistency. For the finest flavor use unsalted (sweet) butter for cooking and baking. Purchase only U.S. Grade AA butter, which is made from the highest quality fresh sweet cream. These are the flower buds from a low, trailing shrub called a caper bush. The unopened buds are packed in vinegar or salt and must be thoroughly rinsed and drained before being added to any dish. Buy either the Spanish or Italian varieties. Heavy or whipping cream should be whipped in a well chilled bowl for best results. Cream can be whipped, covered and refrigerated up to two hours before serving. Always check before serving, as whipped cream may separate slightly. This can be corrected by mixing again very briefly with a wire whisk. Sizes will be specified with each recipe. If they are to be separated, use eggs taken directly from refrigerator. A cold egg breaks cleanly and the yolk is less likely to rupture than in one at room temperature. It is critical that no egg yolk find its way into the whites, for even a trace of yolk will prevent them from reaching full volume. If part of the yolk should fall into the white, use the shell to scoop it out. If egg whites are used in dessert, cream of tartar is added to stabilize them. Recipes in this book call for different varieties of flour. Read labels and recipes carefully. Unbleached flour is a blend of hard and soft wheat. It is recommended for bread, pasta (if semolina flour is unavailable) and some pastry doughs. All purpose enriched flour is a bleached variety and will produce a more delicate pastry dough (especially if the dough is to be rolled). It is also suitable for all cakes in this book. For recipes calling for this type of flour, the term all purpose will be used. Cake flour has a silky consistency and is particularly good for sponge cake. If unavailable, all purpose flour can be substituted but the texture will be a little heavier. To measure, use cups designed for dry measurement. Spoon the flour lightly into cup; do not shake the cup or pack or press the flour. Level lightly with the back of a knife. Semolina flour is used in making pasta. It is weighed rather than measured into cups. See introduction to pasta for details. For coating, I recommend Gold Medal Wondra, an instantized all purpose flour that pours like salt. It will give a much lighter coating for sautéing. Buy bulbs that are tightly closed, with unwrinkled skins of white, pink to purple, or white with purple streaks. Store in cool, dark place. For easy peeling, place a clove under the side of a large knife blade. Thump the blade to split the garlic’s clinging skin; it will slip off easily. It is better to chop garlic finely with a knife than to mash through a press. Buy leeks with crisp, green, unwithered tops and clean white bottoms. Leeks should be straight and cylindrical. If the ends are very bulbous, they will probably be tough and woody inside. To clean, trim roots and a portion of the fibrous leaf tops. Cut the stalks in half lengthwise and wash thoroughly under running water, while holding the layers apart, until no sand appears. An indispensable flavoring in many of my dishes. Try to pick smooth-skinned lemons, which have more juice. The juice can be substituted for vinegar in salad dressing. Use only fresh, never the reconstituted juice, which leaves a bitter aftertaste. Make sure you scrub the outer skin well to remove any coating before using the rind in any dish. Look for the large, light brown type imported from Italy and labeled Porcini. They are rather expensive, but a little goes a long way. Store in jar with tight-fitting lid and they will keep indefinitely. Only purchase the imported oil. For cooking, I prefer a lighter olive oil from Tuscany, such as Bertolli or Berio. Olive oil does not have to be kept in the refrigerator, but it should be kept sealed in a cool, dark place. Refrigerate on lower shelf only in extraordinarily hot weather. (Refrigerated oil turns cloudy but will not lose flavor.) A sealed oil can may be kept for several years, but do not leave oil in an open can; decant into a capped bottle. For a special treat on salads and plain boiled vegetables try one of the extra virgin olive oils. The best extra virgin oils are made entirely by hand and use only the finest olives, which are picked by hand and pressed in a manually operated cold-stone press; the resulting oil is then filtered through cheesecloth. This is the primary reason for the oils’ high cost. My personal favorites are Raineri from Liguria and Badia a Coltibuono from Tuscany. Once sampled, you will never forget their fruity taste. Select those with crisp, green, unwithered tops and clean white bottoms. Try to pick scallions with large, bulbous ends. Trim roots and any brown or limp tops. Wash thoroughly and blot dry with paper towel. Wrap in paper towel and store in plastic bag in refrigerator. Use within four to five days. Halfway between onion and garlic. Store in cool, dark place. To use, divide the cloves. Cut off tops and tails of the shallots. Peel with a small paring knife, pulling away the first layer of flesh with the skin that is usually firmly attached to it. I prefer using this large yellow onion because of its sweet taste. Store in a cool, dark place. If only using a portion for a recipe, the unused part can be wrapped in plastic and stored in the refrigerator for a couple of days. Recipes call for either red or white wine vinegar. Use a good imported brand of vinegar for best results, especially in salads. The three brands I use are Badia a Coltibuono and Bertolli for red and Sasso for white.